There are plenty of clichés to say. There are plenty of stories to tell. But the fact of the matter is that Eddie Mercer, known as “Fast Eddie” to many fans, had never won a Snowball Derby after years and years of trying. In fact, Mercer has tried for 16 years to win the Derby. And every year, he found himself watching the Victory Lane celebrations from afar. But this year, things were different. Mercer had a different outlook on the Derby. The win was a popular one as well. When Mercer crossed the finish line, the packed grandstands erupted. In victory lane, Mercer was being pulled and hugged in every direction by just about everyone. 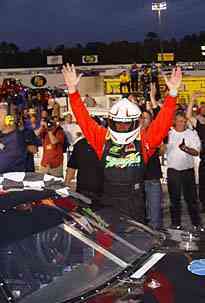 All the media members asked the same question: what did it feel like to finally win the Snowball Derby? 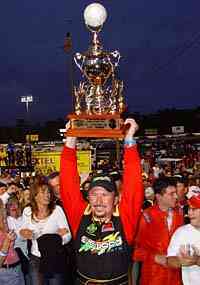 Eddie Mercer was more than happy to win the Snowball Derby. Mercer has been the bridesmaid three times, including last year to Steve Wallace. He’s been third, fourth and fifth. He’s also been strong enough to win the race plenty of times, but has been caught up in accidents, had mechanical failures or other issues. But not on Sunday. He wasn’t going to be denied this time. “I’m not an overly religious man,” said Mercer. “But I had the (stuffed) monkey in the car (read more about that here from 2004) and a bible that Tattoo found in the middle of the road the day he was told he could go to Houston to get treated for cancer. We just had some good omens. A friend of mine had a baby on Friday that weighed 7 pounds, 2 ounces (Mercer’s car is #72). We just felt like it was our year. We just weren’t going to get psyched out about it. I’m just really honored to win the race. Mercer talked about not taking the Derby so serious in 2005. He took it easy and tried to have more fun. And there were plenty of other people happy for Mercer as well. One of those people was fellow Pensacola native Scott Carlson, a Mercer rival for years. There was a story behind how Mercer got to victory lane. He led the first 12 laps before things looked like they might go south very quick. Freddie Query, battling Mercer for the top spot, made contact with Mercer and spun him in front of the entire field. Thankfully for Mercer, none of the cars piled into him and he was able to correct the car and continue on. From there, Mercer had to come from the back. During the middle portion of the race, it looked (and sounded like) his #72 was losing power. However, that wasn’t the case. “We had a right front tire that grew. That made the car really tight. So we just lasted through that run and worried about the next run. leading. When Mercer wasn’t leading, Wallace was. And it was coming down to those two drivers in the end. Wallace held the lead on lap 250. Mercer took the lead for a final time from Wallace after a side-by-side battle on lap 267. Mercer (bottom) just missed trouble all night long. But Mercer was a man on a mission. By lap 190, he was back in the lead. He lost it again during some late pit stops. 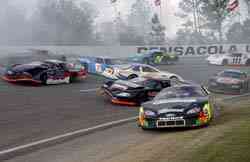 He lost it to his chief rival in the race, Steve Wallace. Mercer was so excited, he got out of his car with his helmet on. “I told my guys that we needed to watch that #2 car (Clay Rogers). I knew he was good and I knew he’d be coming. I thought I was a little better than Steve. I wasn’t discounting Steve by any means, but I was worried about the #2 car. Steve was able to hold him off and give me some cushion. Wallace was happy, but not satisfied with second place. “We qualified way back and started dead last,” said Wallace, who took a past winner’s provisional to make the race. “We got caught up in an early race accident, but we came back for second. I don’t know what happened. I think that Eddie just had a better car this year. We’ll come back here and try it again next year. We had a good time out there tonight. The Pensacola people are awesome and I love this race track. While Clay Rogers finished third, Augie Grill fourth and Bobby Gill fifth, the night still belonged to Eddie Mercer. And as Mercer continued to celebrate in victory lane, with hand shakes and hugs all around from friends, family and fans alike, he also gave a glimpse into his future. “I might, down the road, start working with some young guys like that,” added Mercer. “I’ve accomplished everything I’ve ever wanted to accomplish in racing tonight. If I ever race another race, that is fine. If I don’t, that is fine too. 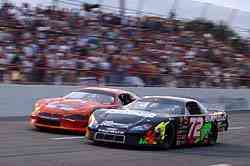 Mercer (#72) races Steve Wallace.